Cosy, colourful decor is just as important as bringing those sweet spices to life in a Christmas cake, and this enticing cake does both! 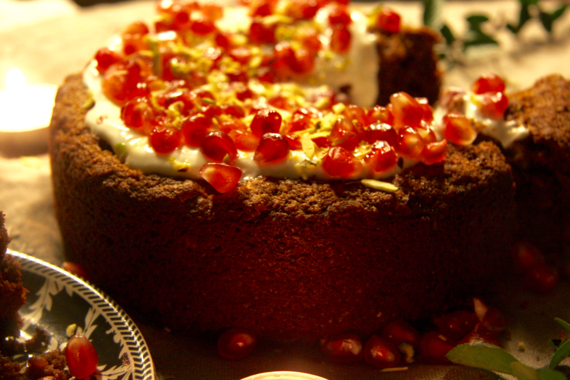 It is soft, made half of almond flour and half of whole wheat or spelt flour, it has lots of sweet juicy cranberries, sultanas and prunes as well as blended satsumas, and it has an abundance of spices, cinnamon, cardamom, ginger, nutmeg, clove and pepper. 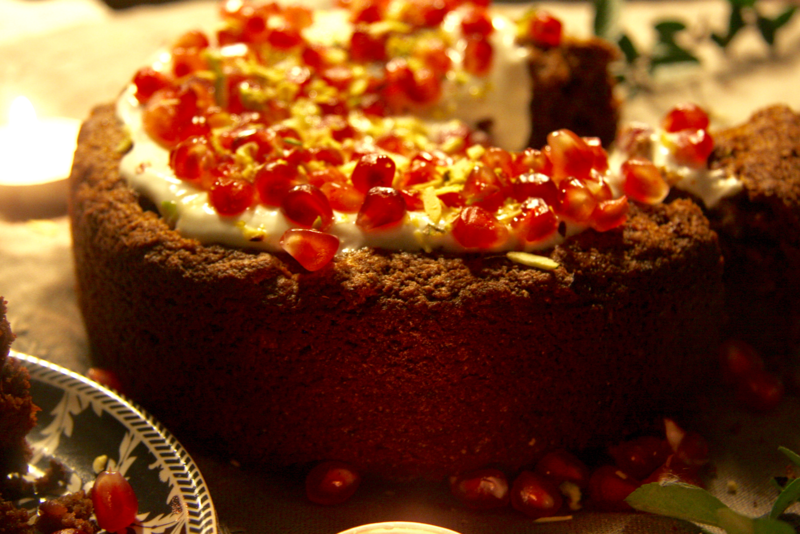 The luxuriously creamy topping is made of soaked and blended cashews, vanilla and coconut oil, garnished abundantly with pomegranates and pistachios. Rich, warm and pleasurably healthy! 1. Start by soaking the cashews in water for a couple of hours or overnight. If squeezed for time, soak in hot water for an hour. 3. Now blend the almonds in a high speed blender so it forms a flour. Alternatively you can use ready almond flour. Now mix together the two flours and the spices. 4. Blend the satsumas with almond milk and melt the coconut oil. You can add the dried fruits into the coconut oil while melting to soften them but this isn't necessary. 5. Pour both these into the cake batter. Add the honey or coconut sugar, baking powder and bicarbonate of soda, and the dried fruits and pistachios if not already added. Mix well and vigorously. 6. Tip the batter into a cake tin and place in the oven for around 40 minutes. 7. While the cake is baking, make the cashew frosting. Remove the water from the cashews, melt the coconut oil and blend all the ingredients together in a high speed blender. Taste for sweetness and pour over the cake. If it seems too thick to pour, add a little more almond milk or water. 8. You can tell that the cake is baked by piercing all the way through with a fork. If the fork comes out clean, the cake is baked. Let the cake cool for a while then remove from tin. 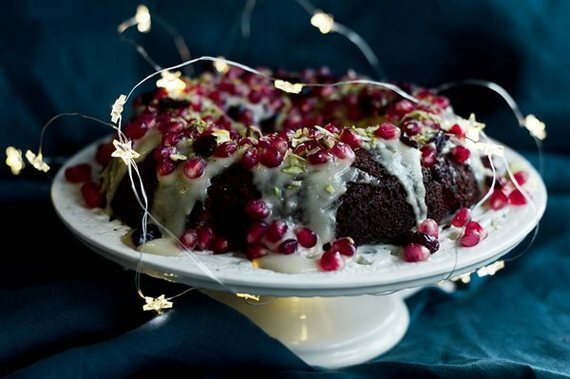 Pour over the cashew cream and garnish with pomegranates and pistachios.